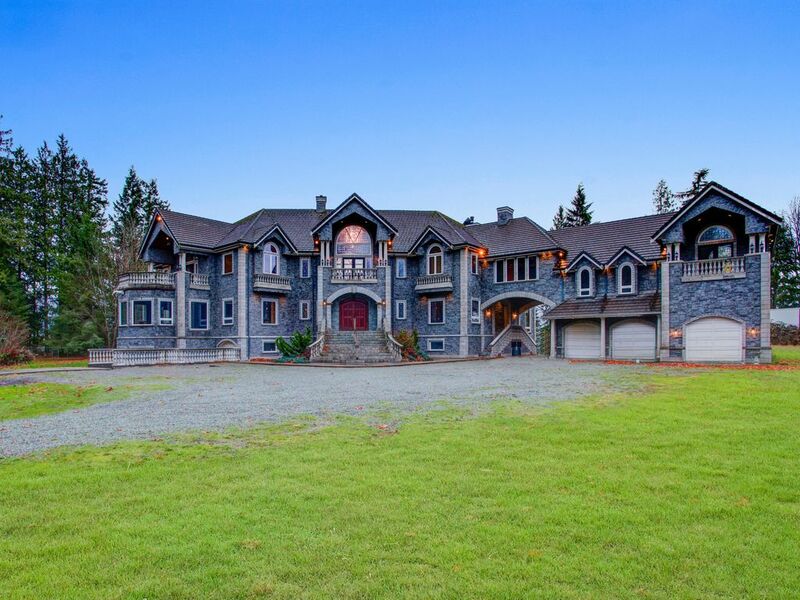 20,000+sq ft Luxury Castle w/ 7 bedrooms, 10 bathrooms + TONS of amenities! Welcome to Graystone Castle, a luxury Castle completed in 2018 with all the amenities you seek; just 1 hour from Seattle or the Canadian border. Located in a private gated neighborhood, Graystone Castle sits on 5+ mature acres of lawn, overlooking the Stillaguamish River and the Stilly Valley. The 20,000+ sq ft castle features 7 bedrooms, 10 bathrooms, movie theater, spa inspired master bath, ballroom, chefs’ kitchen, pool table room, poker room, 4+ dining spaces, 4+ living/lounging rooms, many terraces and outdoor spaces, life-sized chess, arcade games, outdoor fire pit, and MUCH MORE! Our castle offers the perfect blend of gathering places and private spaces for groups! Chefs Kitchen: In addition to the adjoining dining spaces and butler’s pantry; the kitchen features a Viking range and oven, 2 Viking dishwashers, a custom built-in refrigerator/freezer, a x-large basin kitchen sink, an additional prep sink in the large island, an abundance of granite countertop space, and various built-in shelving and food storage spaces. The kitchen comes fully stocked with cookware, dishes, and serving items for 24+ guests. Pair that with its bright open-concept layout and views of the Stilly Valley from every window, you won't want to leave this gem! Dining Spaces: Our formal dining room seats 14 between 2 long tables. The parlor room immediately next-door seats another 6. The dining nook off the kitchen seats 7. The rear outdoor terrace dining set can comfortably seat up to 24 (seasonal). Our ballroom can accommodate up to 80 (tables and chairs provided). Living Rooms: 4 living rooms equipped with comfy couches, fireplaces, and TV's with cable. Outdoor Living (seasonal): Large terrace off the back of the Castle with a family style dining table with seating for up to 24 people, as well as several other terraces throughout the castle. Location: Less than 5 minutes from I-5 and Angel of the Winds Casino. Just 1 hour North of Seattle, or 1 hour South of the Canadian border. Spectacular views overlooking the Stilly Valley and the Stillaguamish River! The Castle is minutes away from prime shopping (Seattle Premium Outlet Mall, Costco, Ross, Target, Marshalls, Michaels, Hobby Lobby, Best Buy), restaurants (Starbucks, Red Robin, Buffalo Wild Wings, Denny’s, Panera Bread, RAM Steakhouse, Olive Garden), and entertainment (casinos, movie theaters, parks, golfing, fishing and swimming holes, seasonal fairs and celebrations). Movie Theater – Comfortably seats 8 in x-large reclining theater seats with individual cup holders and arm rests. Theater is equipped with full surround sound, 4k viewing, swanky theater curtains, cable + dvd + Blu-ray ability, and a library of over 200 DVD’s to choose from. Spa Inspired Master Bath – Featuring a custom designed rain shower, steam shower, jetted spa tub, dry sauna, waterfall feature, laundry room, & custom closets. Ballroom – Our 3-tier ballroom features a built-in custom bar with 2 wine fridges and 2 sinks, two private terraces accessed via double-doors complimented by arched stained glass windows, and a private co-ed restroom. The ballroom comes stocked with tables, chairs, plates, glassware, silverware, and more. Pool Table/Game Room – Equipped with a full-sized pool table, arcade game, large flat screen TV with cable, mini-bar with wine fridge and sink, restroom, private terrace, and comfortable seating. Poker Room – The poker table can seat 6 players + a dealer. The brightly lit and windowed room also features 4 arcade games. Life-Sized Chess – Life-size chess game is set-up near the downstairs living room. Arcade Games – Pinball, Shooting, PacMan, Space Invaders, Asteroids, and MANY MORE arcade games to play throughout the Castle. A play station is set-up in the downstairs living room (and a handful of games are provided). Outdoor Fire Pit – Let us know if you plan to use it, and we will be sure to leave a stack of seasoned firewood, matches, and paper/cardboard. We have 7 bedrooms in total (the master bedroom is #1 of the 7 listed in detail). We have 10 bathrooms; 5 of our 10 bathrooms have showers/tubs. Bedroom #6 (Downstairs) - 1 queen bed and 1 full size daybed in the bedroom, and 2 twin beds in an attached 'bunk den' (designed for children/youth); Shared 3/4 bath (stand-up shower only) **The downstairs bathroom is NOT attached to bedrooms. It is across the living room and down a hallway, near the theater. This bathroom is brand new (basement level was just completed in January 2018). ***Please inquire for additional sleeping arrangements/options (roll-away beds and futons). Maximum occupancy is limited to 25 overnight guests (additional daytime visitors ARE allowed). This property is not available for commercial use. E-mail us, view our website, or find us on social media for updates, photos, videos, history, floor-plans, or more detailed information. Book with confidence; this property is managed to high standard. Great for entertaining and large groups! Gas fireplaces throughout the castle! Built-in refrigerator/freezer. Additional commercial refrigerator in storage room downstairs. We provide a limited amount of pantry items (may include spices, cooking oils, food storage, paper items, etc). Please inquire for more details. Large, open, and fully equipped gourmet-style kitchen with granite counter tops, high-end appliances, wet bar, and butlers pantry. Formal Dining Room seats 14. Parlor Room next-door seats 6. Informal dining nook off kitchen seats 7. Rear terrace dining set seats up to 24. Ballroom can accommodate up to 80 people. We have cable/dish in 7 areas of the Castle. There is a DVD player in the downstairs living room and in the movie theater. We have a pool table and arcade game in the upstairs 'game room'. We also have a poker table and 2 arcade games in the basement 'poker room'. We have a limited amount of games in the downstairs living room. We have a selection of over 150 DVD"s to choose from. We have a PS3 and a small selection of games to choose from in the downstairs living room. Really enjoyed ourselves at the castle!! Great way to getaway with friends and family. Looooved the property and yard to play yard games in. The patio was also a perfect setting for outdoor meals! The inside of the castle was clean and very comfortable! Thank you! Thank you to Emily for being such a responsive property manager and answering all our questions before, during and after our stay! The castle is an amazing experience . . making your stay the memory vs just an accommodation! We took advantage of the fun rooms - pool table, arcades, poker table, banquet room, sauna, turret and most frequently the movie theater room! Great outdoor property, deck and fire pita as well. Definitely an affordable vacation for its size and number of guests that can comfortably stay! It seems to still be a rather new rental that is continuing to grow and was again very responsive and open to needs/suggestions. Thank you Emily and Graystone for a great vacation!! The best place we have stayed through HomeAway with family and friends. I was there with 23 other guests and we were totally stunned by the grandeur and the majestic nature of the Greystone castle and the furnishings through out the castle. The holiday decor for Christmas made the place even more special for the kids. We absolutely loved it and everyone wanted to plan another trip together at this place. I would absolutely recommend this place for any family / friends reunion. My family rents a home every year for a family gathering. We have never rented the same house for 2 years in a row. We will rent this home again. The home was exactly as described, well maintained and clean. For our family, it was the perfect location. Emily was exceptional in anticipating our needs and providing solutions. This was truly the ideal situation for our needs. Once in lifetime experience!! A total MUST!! Emily Peterson, mgr. most awesome lady! This castle perfection now and understand more improvements to come. She made sure everything was perfect for family reunion last weekend I hosted. Everyone who walked through front doors were in total awe and couldn’t believe they were experiencing it! My family and I will return and stay longer three days not long enough!! We loved our stay at Graystone Castle! Our grandchildren, ranging from 3 months to 17 years, as well as our 3 children and their spouses will never forget this long weekend and it was not a bad way to celebrate our 50th anniversary. We enjoyed all the amenities, from the piano to the pinball. This may be the best money we have ever spent for lodging!